Live and loud in the US! Bad Bunny is a rising star in the American music scene. 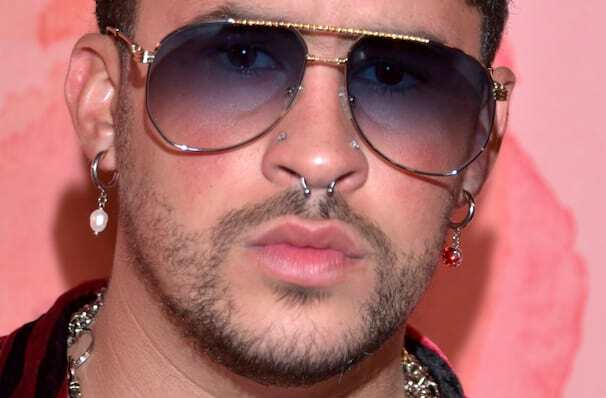 Having quickly gained fame in 2016 for his Latin rap and topping the charts in 2018 with Cardi B's 'I Like It Like That', Bad Bunny's first singles saw him rise rapidly through the highly competitive ranks of Latin American music and now there's no slowing him down. Now with over two million subscribers on Youtube and three million followers on Instagram, Bad Bunny is looking to cross the music border and bring his trap beats to the ears of the US audience. Having featured on reggaeton's biggest tracks Bad Bunny is quickly becoming one of the newest and most exciting voices in the trap, rap and reggaeton genres. Sound good to you? Share this page on social media and let your friends know about Bad Bunny at Bank Of Oklahoma Center.